Oliver Reginald Tambo or OR Tambo for short was born in 1917 and died in 1993. 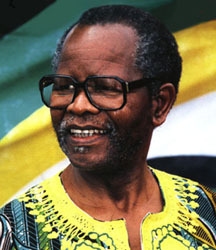 OR Tambo was a central figure of the African National Congress and was an avid anti-apartheid politician. On the 27th of October in 1917 Oliver Tambo was born. His mother was Julia and his father was Mzimeni. OR Tambo was born in Nkantolo in Bizana in the eastern part of Pondoland which is now named the Eastern Cape. After OR Tambo matriculated from St. Peters Johannesburg where he then proceeded to do his university degree at the Fort Hare University, however in 1940 he was expelled from the university along with Nelson Mandela because they took part in a student strike. OR Tambo went back to Johannesburg to teach science and mathematics at his former high school in 1942. OR Tambo, Mandela and Walter Sisulu founded the ANC Youth League in 1943 and became the first National Secretary of the league to become the National Executive in 1948. The ANC protested the anti-apartheid movement through the use of petitions and demonstrations, however the ANC Youth League believed that these actions were not enough and created their own programme of action which included various tactics like civil disobedience, strikes, boycotts and non-collaboration. The OR Tambo Airport also known as OR Tambo International Airport is an international airport which is a major airport situated in Kempton Park in Gauteng which is near Johannesburg. OR Tambo Airport is the hub for most international and domestic travel from and in South Africa and is able to cope with 28 million passengers per year. The OR Tambo Airport is also the centre for South African Airways which is South Africa’s largest domestic and international flight carrier as well as local airlines that fly domestically. OR Tambo airport was not always named this and before was called the Johannesburg International Airport and before this it was called the Jan Smuts International Airport. 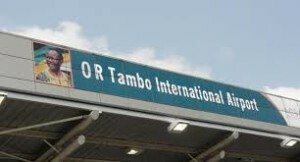 The name was first changed in 1994 after the new South African Government came into being and in 2006 it was once again renamed to OR Tambo in dedication to the former President of the African National Congress. The OR Tambo airport is classified as a hot and high airport which means that because of where it is placed the air is thin as its 1700 meters above sea level. The effect that this has on the airplanes is that the aircraft’s need to reduce their weight by having less fuel. Also the runways are also longer because of the air being thin. There are also shuttle buses available to transport you in and around O.R Tambo International Airport. OR Tambo International Airport is more commonly known by international travellers as Johannesburg Airport. Founded in 1952 Johannesburg Airport has formerly been known as Jan Smuts Airport. Johannesburg International Airport was its formal name from 1994 since the downfall of apartheid but in 2006 underwent another name change to the current O.R. Tambo Airport. It is one of two international airports in the city of Johannesburg with the other being Lanseria Airport. Johannesburg Airport is the busiest and largest in Africa and is located in the business hub of South Africa catering for both commercial and private travellers. Johannesburg Airport is also the headquarters for SAA, the national flag carrier airline of South Africa. 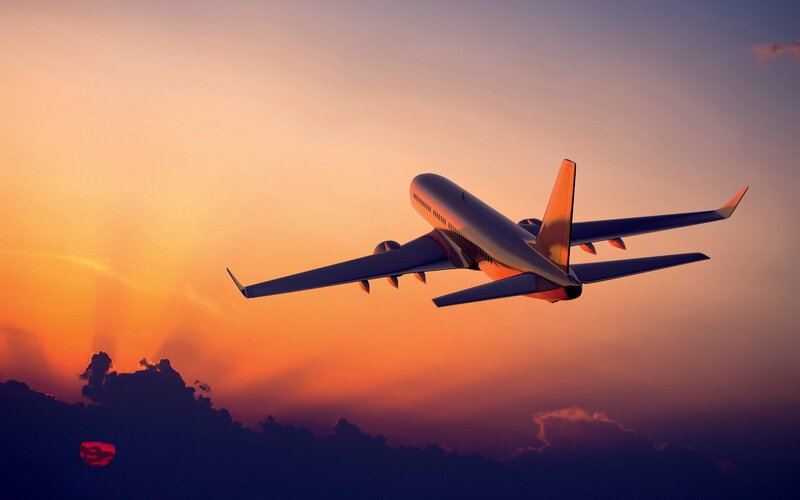 Capable of handling 28 million passengers annually, Johannesburg Airport conducts direct flights to all continents with the exception of Antarctica. 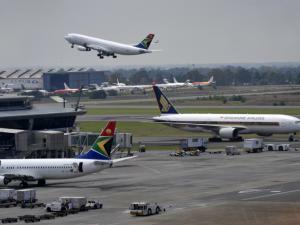 A number of major airlines operate from Johannesburg International Airport including SAA (or South African Airways), British Airways, Singapore Airlines, Emirates, Airlink and Virgin Atlantic. Domestic airlines Flysafair, Kulula and Mango Airlines operate multiple flights at the airport daily. Johannesburg Airport is also capable of handling 650000 tons of cargo per year. Johannesburg Airport was one of many airports in South Africa that underwent renovations in preparation for the FIFA World Cup that took place in the country in 2010. Johannesburg Airport has 2 runways which measure at 3400 and 4400 meters. The latter is one of the longest runways in the world. There are a total of 6 terminals at Johannesburg Airport which are categorized as being International, Domestic or Transit. Information kiosks can be found in both the international and domestic arrival terminals. Johannesburg Airport has 5 domestic lounge offerings and 9 international lounges for guests to unwind in away from the bustle of the rest of the airport. 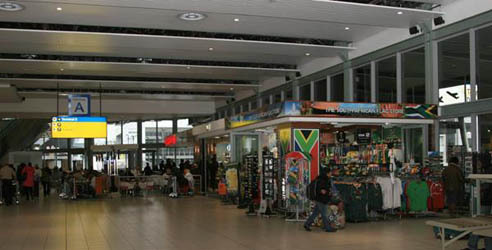 Johannesburg Airport has over 140 retail stores which are open from 6 in the morning until 10 at night. These times also apply to banks, bureau de change, dry cleaners, pharmacy and the spa. In additional, the duty free stores also stock products that are exclusively available only at Johannesburg Airport. Johannesburg Airport also houses a travel clinic, open 24 hours a day with full medical staff. There is plenty of paid parking at the airport which can be paid in cash or with credit cards. Parking areas were also included in the refurbishment of the airport and now includes technology which allows visitors to easily spot available spaces. There are 3 transport options when it comes to leaving the airport. There is a rail option of using the Gautrain system to get from the airport to Sandton. From there the Gautrain also has various other stops within Johannesburg. Public buses are available at the airport in the mornings and afternoons for the influx of visitors during these times. Private buses also operate from the airport. The third option is to rent out a car which can be done directly at the airport. There are 10 car rental agencies at the airport which are Avis, Europcar, Bidvest, First Car Hire, Hertz, Tempest, Thrifty, Select Car Hire, Capital and Woodford Car Hire.